The multi-band source catalog delivered in this data release is intended as "general purpose" catalog. The source parameters included in the catalog are based on double-image mode runs of S-Extractor, where the r-band coadd of each tile is used as detection image and the detection set-up is identical to that used for the single-band source lists (see the table on the source lists page. Since the r-band image is on average the best quality image for each tile, the S/G separation provided in the catalog is the same as in the r-band single-band source list. The same masking flags (see the table on the masking page) are also included, for each filter. The source magnitudes and fluxes in the catalog are not corrected for Galactic foreground or intergalactic extinction. Seeing differences between filters are accounted for by aperture corrections. These aperture corrections have been calculated for each filter by comparing the flux in the aperture magnitudes included in the catalog with the flux in a 6 arcsecond aperture, which is the aperture size used for photometric calibration. The resulting aperture corrections are applied to create the aperture-corrected fluxes included in the catalog. To prevent sources in tile overlaps from appearing multiple times in the catalog, the survey tiles have been cropped to seamlessly connect to each other. This means that along the edges of survey tiles the data are less deep, but no worse than in the areas located in the gaps between the rows of CCDs in the focal plane. Contamination of the KiDS multi-band catalogue by spurious sources was analysed through a comparison of the overlap between KiDS-ESO-DR2 and the CFHT Legacy Survey, the main deeper survey overlapping with the current release (CFHTLS-W2, using their final data release T0007). For the analysis it is assumed that all KiDS sources not detected in CFHTLS-W2 are spurious. Since some fraction of real sources might be absent in the CFHTLS catalogs, the spurious fractions derived should be considered upper limits. 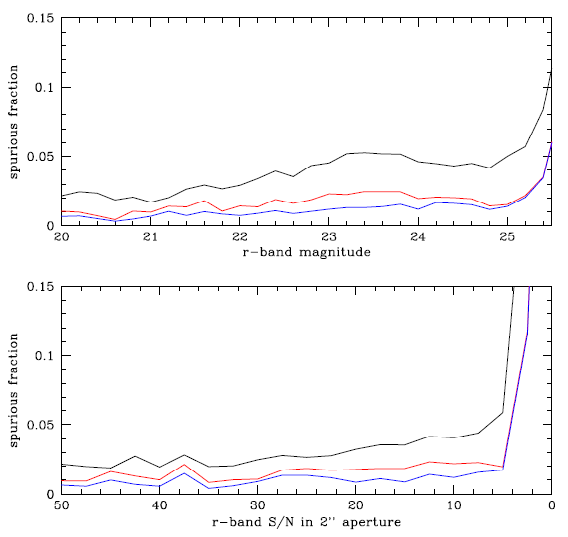 The figure below shows the spurious fractions derived from this comparison as function of magnitude (r-band MAG_ISO) and signal-to-noise (in a 2'' aperture). When all sources in the catalog are considered the fraction of spurious sources is estimated to be <5% down to a very low SNR of ~5 within a 2'' aperture. Filtering sources based on masking information reduces this fraction to ~2%, demonstrating that caution is required when using faint sources in masked regions. When also sources with non-zero SExtractor detection flags are filtered out, the spurious fractions drops even further to ~1%, yielding a very clean catalog down to the detection limit. An internal estimate of the completeness of the catalog is provided per tile, based on the method of Garilli et al. 1999 (A&A, 342, 408). It determines the magnitude at which objects start to be lost in the source list because they are below the brightness threshold in the detection cell. The implementation is similar to La Barbera et al. (2010, MNRAS, 408, 1313). Estimates of the completeness obtained by comparison to deeper CFHTLS-W2 data are consistent with these internally derived values. The distributions of the 98% completeness magnitudes for all tiles are shown in the figure in the data product quality section, where for the catalog the values for the r-band apply. The typical 98% r-band completeness magnitude is 23.9.